Indian Institute of Minerals Engineers, 2013. ISBN 81-901714-4-5. The book is also available for free download in pdf format from the IMPC 2012 website. 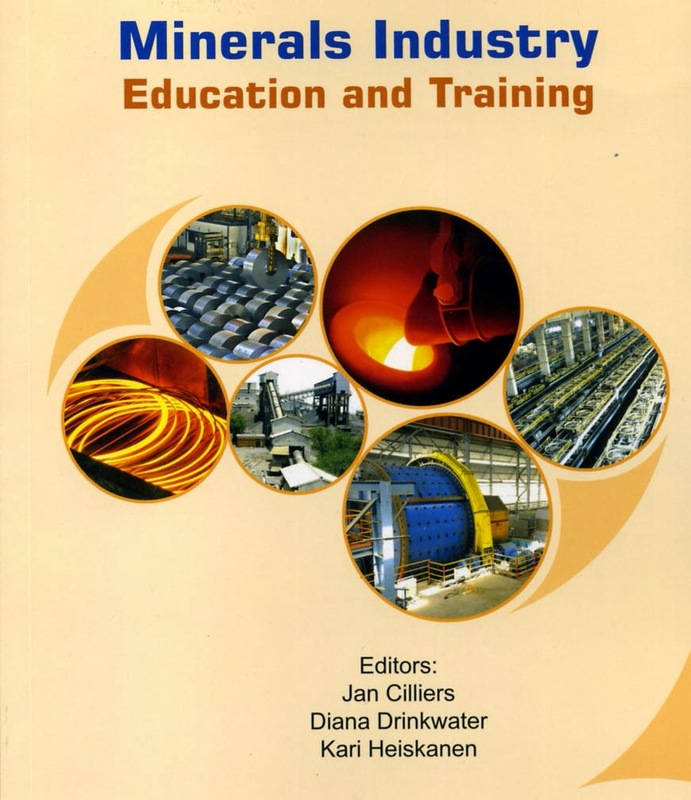 The Council and the Commission are of the view that the topics covered in this book will be of great interest to leaders in both industry and the academic and research sector. Should you or your colleagues wish to obtain any further information on the activities of this Commission or wish to participate in its on-going activities please contact Professor Cilliers at j.j.cilliers@imperial.ac.uk. I have received this photograph from my old friend Prof. Gulhan Ozbayoglu, who I first met at the NATO Advanced Study Institute in Bursa, Turkey in 1984. 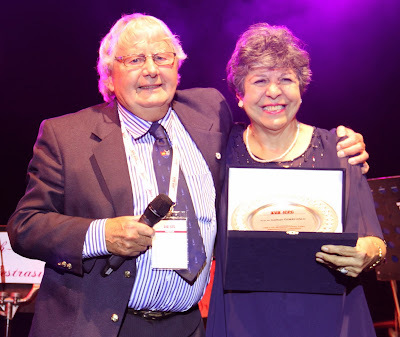 She is pictured with Doug Jenkinson, who I have not seen since the 1992 International Mineral Processing Symposium, also in Turkey, at Antalya. Gulhan was chairman of the organising committee of the 17th International Coal Preparation Congress (ICP), held between 1st and 6th October in Istanbul. Doug is the UK representative on the International Organising Committee. This was the first time that an ICPC was organized in Turkey since the 1st ICPC in 1950 in Paris, France. The ICPC has been organized every four years under the leadership of the International Organizing Committee (IOC). Starting with the 17th ICPC in 2013, the ICPC's will be held every three years, the next scheduled for St. Petersburg, Russia in 2016. Generally, the topics discussed in the ICPC's cover a large area from characterization of the coal to waste disposal but topics related to water use/reuse have attracted increasingly more attention in recent years. In this regard, dry processing and dewatering seem to continue to be of great interest in many areas of the world. Around 525 participants from 25 different countries attended the congress and 121 papers selected from around 230 abstracts were presented in two parallel sessions during the four days of the congress. Selected papers will be published in a special issue of International Journal of Coal Preparation and Utilization. It's good to see so much recent news of awards to young people. Now news from India, submitted by D.M.R. Sekhar. The Mineral Engineering Science Association of India confers four MESA Awards to young and promising mineral engineers/ scientists every year. These awards were instituted in the honour of Prof. C. Mahadevan, Prof. C. Chiranjeevi, AC Datta and BN Chaterjee. The photo below shows Dr. Y. Rama Murthy being presented with one of these awards by Ibrahim Ali, Director of Wonder Cement. Dr. Rama Murthy received the AC Datta MESA Award on 15th September at the Institution of Engineers, Udaipur Chapter, for his research that led to the reduction of chromite losses in an operating plant. He is a Principal Researcher with Tata Steel Ltd, Jamshedpur. The award was presented by Akhilesh Joshi, CEO, M/s Hindustan Zinc Ltd.
Over the last two decades the Discrete Element Method (DEM) has become an important tool for understanding comminution fundamentals and providing information for the design, optimisation and operation of comminution devices. Over that time, the application of DEM in simulating fracture, breakage, crushing, milling and equipment wear has increased in size and complexity. Information from DEM has contributed to modelling techniques such as mechanistic modelling, the Unified Comminution Model and the Virtual Comminution Machine. These have enabled step changes in understanding of comminution processes. DEM is now widely used in industries where comminution is critical. Important challenges remain for the next decade including representation of unresolved fine material: prediction of its influence on the overall processes and its size reduction. Similarly, slurry phase transport and rheology have barely been touched on in using computational techniques in comminution modelling. Most importantly in the future is the uptake of the DEM outputs into standard comminution models used in design and optimisation of equipment and processes, as despite the progress made in understanding and in quantitative outputs the barriers to routine uptake have not been surmounted. Among the leaders in this field are workers from CSIRO and JKMRC in Australia, Chalmers University in Sweden and Universidade Federal do Rio de Janeiro in Brazil, all of whom will be presenting up to date work in this area at Comminution '14. They have also just published an excellent review on the contribution of DEM to the science of comminution in the journal Powder Technology. A reminder to you all that the deadline for abstract submission to Comminution '14 is October 31st. Just back from this evening's sundowner. 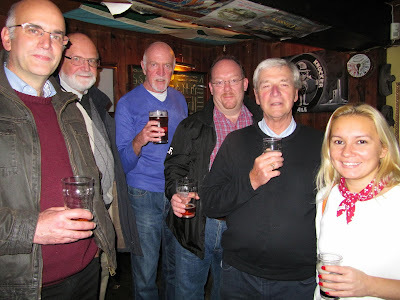 Due to our grandson's 9th birthday party we arrived late, but there were still a good few enjoying the local ales at the Chain Locker. Amongst those making their debut tonight was CSM's Dr. Patrick Foster, who I last saw at the SME Meeting in Denver, and Prof. Bernd Lottermoser, of the University of Exeter in Cornwall, who only this week was appointed as a keynote lecturer at Process Mineralogy '14. Is this the world's longest flotation bank? Last week's visit to Minera Valle Central (posting of 15th October) was one of the most interesting mine visits that I have ever undertaken. The plant treats old and current tailings from El Teniente copper mine, 40km away, and uses natural gravity flow in a process known as cascade flotation. I am not sure whether this is unique to this plant, but I have certainly not seen or heard of it being used anywhere else. The tailings are introduced into four parallel troughs, two kilometres in length, in a stepped, or cascade, arrangement. As the slurry flows down the incline, air is induced by the natural turbulence. No reagents are added, as these are already present in the water in the tailings. The mineralised froth which is produced is fed every few metres into a kind of pinched sluice, which deepens the froth, which is diverted as a concentrate. Final tailings is the slurry which remains after the 2-km journey. It is fascinating as you will see in this short YouTube movie. Correct me if I am wrong, but I believe this was designed by Rainer Imhof, the inventor of the Imhoflot G cell, which was displayed at Procemin '13 in Santiago. Making use of natural gravity flow is, of course, nothing new. 19th century miners built their processing plants on hillsides to make use of gravity flow before the advent of centrifugal pumps, but I have never seen it used in flotation. I have seen something similar in Malaysia however. Palong concentrators also utilise long sloping troughs down which slurry flows over a series of baffles, behind which the tin mineral, cassiterite, and other heavy minerals such as monazite, zircon and ilmenite settle out. Periodically the flow is stopped, the baffles are lifted and the heavy mineral concentrate is sluiced out. 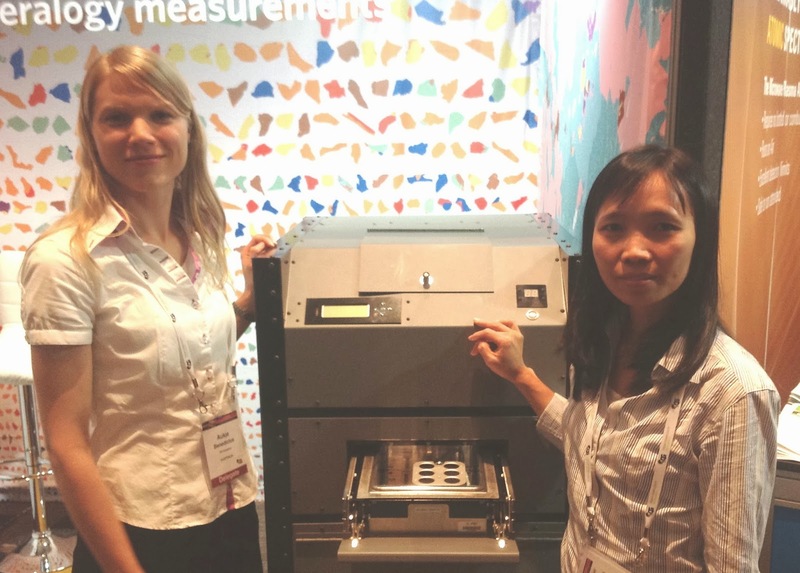 Gecamin's Procemin '13 was held at the Sheraton Hotel, Santiago, Chile from October 15-18. 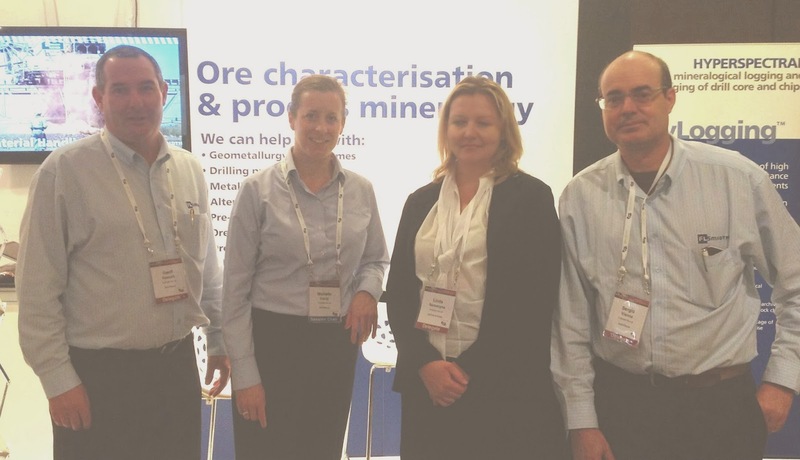 Founded in 1998, Gecamin organises highly technical, international seminars and conferences that focus on generating interdisciplinary collaboration within the mining industry. 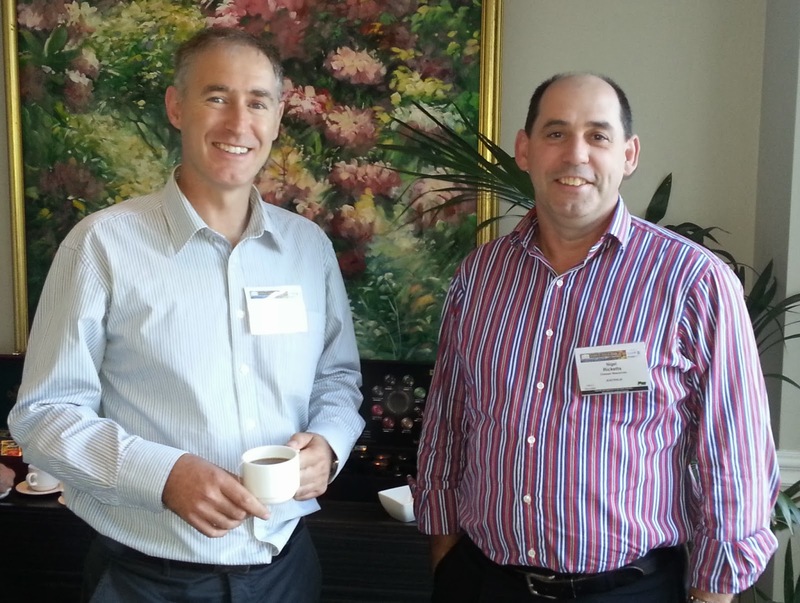 Procemin '13 was the 10th in Gecamin's series of international mineral processing conferences. MEI is one of the six media partners, and I am here mainly to meet people and provide an overview, so I hope that my notes will be supplemented by comments from attendees. Procemin began today with an optional visit to Minera Valle Central, which processes current and old tailings from the giant El Teniente copper mine (see posting of October 15th). After registration and opening speeches in the evening there was a welcoming reception, and a big screen viewing, courtesy of Metso, of Chile's 2-1 defeat of Ecuador, to qualify for next year's World Cup. Hopefully a good omen for the next few days! It was good to meet Carlos Barahona, the General Manager of Gecamin, and his daughter Carolina, Communications Coordinator, and to discover that, like MEI, Gecamin is also a family business. Probably why they run such well organised events! I had breakfast this morning with Procemin's Technical Director Romke Kuyvenhoven, who was pleased to hear my views on yesterday's field trip. She is considering including this in the programme for next year's IMPC, also organised by Gecamin, and if it is I would definitely advise that you reserve a place. Romke tells me that over 380 delegates have registered for Procemin, around two thirds being from Chile. She was disappointed that the first plenary speaker was unable to attend, so the morning session started a little later than planned with a plenary talk by John Wells, now an independent consultant from Canada. John discussed the huge cost escalation that has occurred in the first 12 years of the 21st century. Project capital costs have been reported to have doubled, tripled or even quadrupled in this time period. This has rendered many projects to be no longer economically viable and has caused a crisis in the industry. He provided some ideas and suggestions in which capital costs might be reduced and control of capital costs improved. The second plenary was presented by Gustavo de la Torre of Milpo, Peru, who discussed the application of safe and socially responsible technology in tailings disposal at the Cerro Lindo Mine. This, as will many of the papers, was presented in Spanish, but there are excellent simultaneous translation facilities at the conference. After the coffee break the programme split into parallel sessions, on Project Development, and Fundamentals of Flotation. The latter included a paper by Kari Heiskanen, who will be presenting the keynote lecture in the Fundamentals symposium of Flotation '13 next month. The long afternoon programme contained four technical sessions, comminution dominating with a session on High Pressure Grinding and one on comminution equipment and media wear. The former contained two presentations by Chris Morley of Ausenco Services on equipment selection for HPGR-based comminution and two papers from Metso, a major supplier of HPGR. Laboratory testing and flotation scale up was the theme of the 3rd session, with papers from Australia, Canada, South Africa and Mexico. The 4th session contained a discussion panel on the theme of tailings filtration and dry stacking. The day ended with an open IMPC Committee, where plans for next year's event in Santiago were outlined by Chairman Juan Yianatos. It is expected that over 1000 delegates will be here for the IMPC and over 800 abstracts from 44 countries have already been received! The IMPC created a commission on education a few years ago to study the supply and demand of mineral processors worldwide. Jan Cilliers of Imperial College, UK, chaired this commission and this morning he presented an excellent keynote lecture on the study's findings, which have also been published in book form and will soon be available for download on the internet. I will post further details on this in a later blog. Although the report contains much speculation on the demand side, it is obvious that the supply chain is slow and long term needs must be considered and planned for, a difficult task considering the unpredictable and cyclic nature of the industry. Jan has presented the findings at a number of recent conferences, but each time the data has been refined, such that now it is a very useful guide to the global situation with some very surprising findings. Western Europe, for example, produces only 50 graduates per year, compared with China's 2920! In his IMPC update yesterday Juan Yianatos noted that the major areas for abstract submission were, unsurprisingly, flotation and comminution, and today's parallel sessions focused on these important areas. In the morning session, on comminution process modelling, SAG mills and stirred mills, which have become increasingly used over the last few decades, were highlighted. Metso, who manufacture one of the most widely used stirred mills, provided a review of their Vertimill pilot plant operation for grinding studies. There are over 430 Vertimills in operation worldwide. Metso is one of the sponsors of Comminution '14, as is Starkey & Associates, Canada and John Starkey presented an interesting paper on optimising the design of SAG mills in order to achieve design tonnage from start-up. The other parallel session this morning was on the theme of flotation plant optimisation, with papers from Chile and Australia. A very interesting panel discussion on fine grinding took place after lunch, with short technical presentations from some of the big players in this field, Metso, Xstrata Technology, Outotec and Glencore Peru. Brian Knorr of Metso USA provided a short update on Metso stirred milling technologies. The Vertimill is a gravity-induced stirred mills and can grind well to about 20 microns, mainly for regrinding applications. The Stirred Media Detritor is a fluidised stirred mill used for very efficient fine and ultrafine grinding below 20 microns, but they are very sensitive to conditions. Metso is in the midst of a 3 year programme with JKMRC to optimise and validate current selection methods. Karina Arburo discussed fine grinding from an Xstrata Technology perspective. She talked about assessment of the best testing method for energy and scale up in IsaMills and that fine grinding requires fine media using attrition, not impact. Dante Garcia of Glencore Peru discussed fine grinding in stirred mills from an operational point of view. Using IsaMills it was found that rounded media is more efficient than angular media, and lighter media was more efficient for fine grinding. Although fine grinding improves liberation, floatability is reduced at fine sizes, so a compromise on flotation size must be made. He considered that flow control and adequate maintenance are the main factors in successful regrinding using stirred mills. Ilkka Roitto of Outotec, Finland, then showed how to control regrinding to reach optimal process results and energy efficiency. This panel discussion, which emphasised the importance of circuit control, unfortunately ran in parallel with another relevant session on simulation and control, then after the coffee break there were parallel sessions on concentrator management and operations, and waste management. An interesting plenary lecture this morning was presented by Jeffrey Dawes of Komatsu, Chile. Over the last few years a tendency has developed to outsource specific aspects of the mining process to the respective 'experts', such as is the case for equipment maintenance and repair services. While this makes perfect sense in terms of optimising resources and sharing risk, the fact that each of the different players in the production chain are looking to maximise their own individual result does raise the question of whether all have the same objective. Considering the extent of instant communications that exist today, resulting in the possibility of organising massive events in a matter of hours, communication between the different parties in the mining value chain surely can be improved, in order to optimise the process both for the process owner, the mining company and their suppliers. John Herbst of Metso Minerals, USA presented the second plenary, showing how advanced modelling and simulation methods have evolved over the last half century. In the last 50 years prediction errors for advanced mineral processing models have been reduced from about 20% to less than 1%; if computer developments continue and gifted investigators from a variety of disciplines see the value of joint efforts, then strong advancements will continue to occur. There were two very interesting sessions after the coffee break, but unfortunately running in parallel. Geometallurgy is the latest edition to the mineral processing lexicon and has already been the subject of a major conference this year, and is an integral part of MEI's Process Mineralogy '14. Romke Kuyvenhoven chaired a panel discussion on geometallurgy, which ran in parallel with a session on flotation equipment. The world's largest flotation cell will soon be installed and tested by FLSmidth at a mine in USA. The 600 Series SuperCell will be used as a rougher-scavenger in the copper flotation circuit. 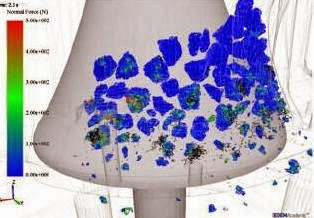 Flotation '13 keynote speaker Dariusz Lelinski described how CFD models of existing cells were used to develop these huge cells, the volume of which varies from 600 to 700 m3 depending on launder configuration. Other papers in this session discussed the use of flotation columns, Jameson Cells and forced-air flotation machines. This has been an excellent conference, in terms of networking and quality of papers. The papers are available in a Proceedings volume (ISBN 978-956-8504-99-1) from Gecamin. I congratulate the organisers on their professionalism. It has been my first Procemin conference, but it will not be my last! I now look forward to returning to Santiago next year for the IMPC, which I feel is in safe hands with Gecamin as organiser under the chairmanship of Santa Maria University's Juan Yianatos. After a long and fruitful day at Procemin '13 it was good to stroll into downtown Santiago this evening for a reception hosted by Sarah Schwarz and Diana Drinkwater of the JKTech. Sarah relocated to Santiago from Brisbane 18 months ago, and it was great to hear how she and her family have settled into their new life in Chile. Sarah and Office Manager Claudia Maturana Pino run the Chilean office of JKTech. 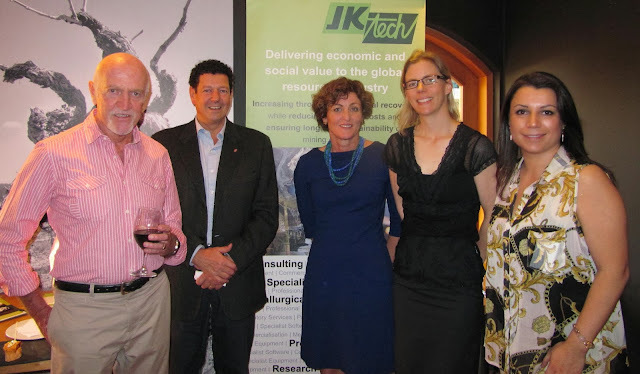 Congratulations to Diana, the Technical Programme Manager for the JKTech in their main Brisbane headquarters. Yesterday she became the first woman to be elected to the International Mineral Processing Council. This is richly deserved; Diana is dynamic and a great networker and will be a tremendous asset to the IMPC. She embraces modern social media such as LinkedIn and Facebook, all of which help to promote our industry, particularly to young people. Today I took part in a visit to Minera Valle Central, an optional day in the Procemin '13 programme. It was perhaps the most interesting mine visit that I have ever made, so it was surprising that of the 300+ delegates registered for the conference, only about a dozen signed up for this. Valle Central started operating in 1992 with the purpose of recovering copper and molybdenum from the concentrator tailings of Codelco's El Teniente Division, the world's largest underground copper mine, fed to the plant by gravity flow in a 40km long launder. In the first stage, the operation was focused on the treatment of the fine fraction of the tailings, operating a 100,000 tons per day flotation plant, in a novel cascade arrangement, resulting in a low grade concentrate, which could then be upgraded in a conventional flotation plant. After 1992, Valle Central developed an expansion program to increase its production, by incorporating the recovery of the copper contained in the coarse fraction of the tailings. This coarse fraction represents approximately 45% of the copper in the tailings, which could not be recovered by the cascade plant designed only for the treatment of the fine fraction of the El Teniente tailings. By the end of 1996, Valle Central began the operation of a new 30,000 tons per day plant, incorporating grinding and classification of the coarse fraction of tailings, feeding a conventional flotation circuit. The current process consists of classification of all tailings, assaying around 0.12% Cu, that are received daily from El Teniente, as well as tailings assaying around 0.3% Cu recovered by high pressure monitoring from the old tailings dump, grinding the coarse fraction in closed circuit, followed by conventional flotation, recovering a concentrate from the fine fraction, and producing final saleable copper and molybdenum concentrates. In 2012 the plant produced 23,000 tones of copper and 970,000 lbs of molybdenum. What was particularly fascinating was the process of 'cascade flotation', unique to this operation. I will not attempt to describe it now- I am preparing a YouTube video of the process which I hope to have ready next week. 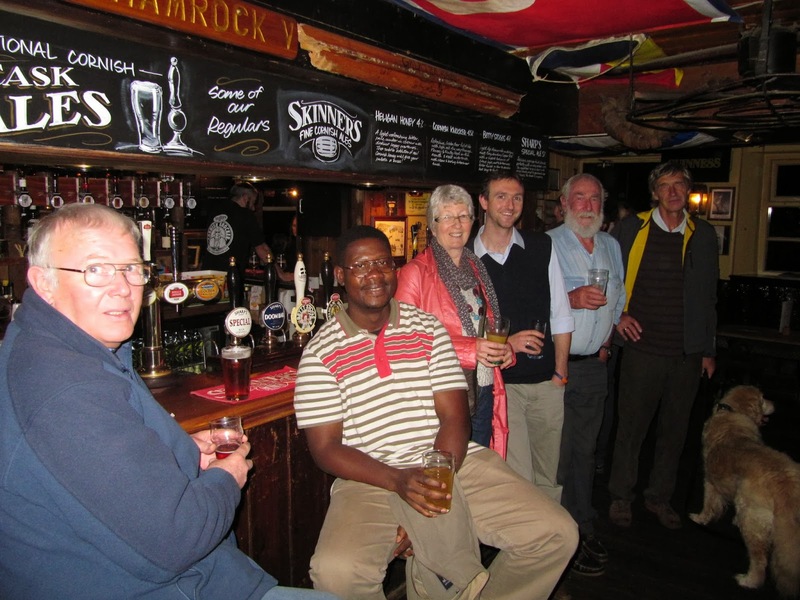 A great surprise this evening was finding an old Zambia colleague in the bar, chatting to IMPC Chairman Cyril O'Connor. I worked with Roger Kelley at Nchanga in the early 1970s and have not seen him since, until this evening. Roger, 72, lives in Chile and is an independent metallurgical consultant, travelling enthusiastically around the world. It was great to meet up with him after all this time. After arriving on midday Saturday I have spent the last two days relaxing and wandering around Santiago, the capital of Chile. 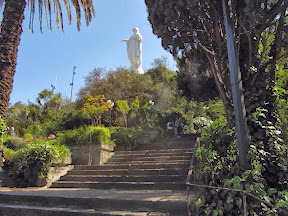 It was founded by Spanish Conquistador Pedro de Valdivia in1541, who chose the location because of its climate, abundant vegetation, and the ease with which it could be defended against the Incas - the Mapocho River then split into two branches and rejoined further downstream, forming an island. 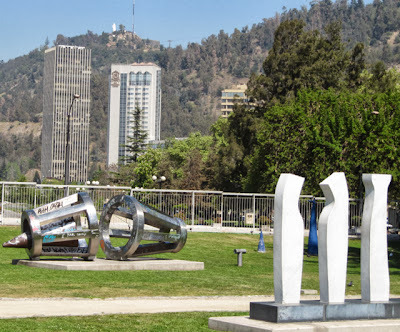 This is my 3rd visit to Santiago, the last time being in 1997 for Minerals Engineering '97 and it is evident that its steady economic growth over the past few decades has transformed it into a modern metropolis, with a rising skyline, including the tallest building in Latin America, the 300m Gran Torre Santiago. 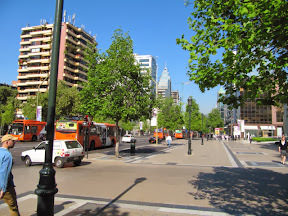 The cityscape is shaped by several stand-alone hills and the fast-flowing park-lined Mapocho River. Mountains of the Andes chain can be seen from most points in the city and they apparently contribute to a considerable smog problem, particularly during winter. The city outskirts are surrounded by vineyards, and Santiago is within a few hours of both the mountains and the Pacific Coast. During our previous visits Barbara and I skied in the nearby Andes and spent a pleasant week on the coast at Vina del Mar. All in all it is an ideal setting for next year's IMPC and the IMPC Council are here in force this week for their final site inspection. They will be impressed - it is a beautiful city ideally suited to exploring on foot. I was up very early on Sunday morning and met John Herbst near reception. He represents USA on the IMPC and he had just arrived after an exhausting journey from his home in Hawaii. 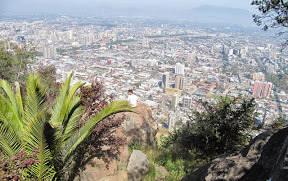 After breakfast I walked up Santiago's most famous hill, San Cristobel, light training for next month's assault on Table Mountain! 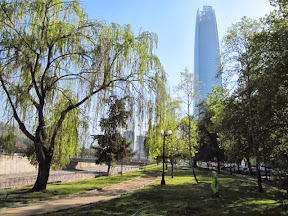 This morning I walked along the river bank to the city centre, its hustle and bustle in sharp contrast to the Sheraton's location at the foot of San Cristobel hill. Travelling to Chile from UK is long and tiring, and I arrived in Santiago at midday today after a 15 hour flight from Heathrow via Sao Paulo. I am here for Procemin '13 which starts with a field trip on Tuesday. Apart from myself there were a few more early arrivals today, and I had a late lunch with Kari Heiskanen of Aalto University, Finland, and chatted briefly with Graham Heyes of CSIRO, Diana Drinkwater of JKTech and Jan Cilliers of Imperial College. I hope to be providing daily updates, either here or on the Twitter feed in the right hand column, and will publish a full report on the conference, with photos, early next week. I was really pleased to hear the news (MEI Online) that Prof. Mauricio Torem will be the new editor of International Journal of Mineral Processing from next January. Over the years Mauricio has become a good friend of the family. He represents Brazil on the Editorial Board of Minerals Engineering, and regularly attends MEI Conferences, particularly in Falmouth, a town that he has grown to love. He brings great enthusiasm and drive to everything that he does, so I am sure that the future of IJMP will rest safely in his capable hands. Congratulations from all your friends at MEI. 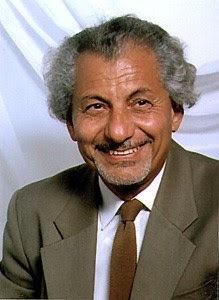 Prof. Fathi Habashi, Emeritus Professor at Laval University, Canada, is a truly remarkable man. I know many septuagenarians in our industry who have no thoughts of retirement, and quite a number of octogenarians, but few as active as Fathi, who celebrates his 85th birthday today. His energy is boundless, and he still travels the world presenting courses and keynote lectures, and is a prolific writer of books. I see him every year at the SME Annual Meeting, where he not only attends but makes presentations, often describing his travels. At next year’s meeting in Salt Lake City he will be reporting on his travels in Turkey. Also next year he publishes a new book A Metallurgist on the Move, describing the places that he has been to and the friends that he has made in his very long life in the minerals industry. 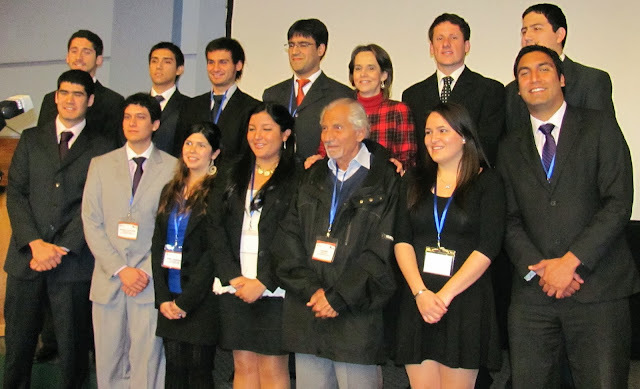 This year he has been in South America, in August at Vina del Mar, Chile, where he was guest speaker at a conference organised by extractive metallurgy students at the Catholic University in Valparaiso. 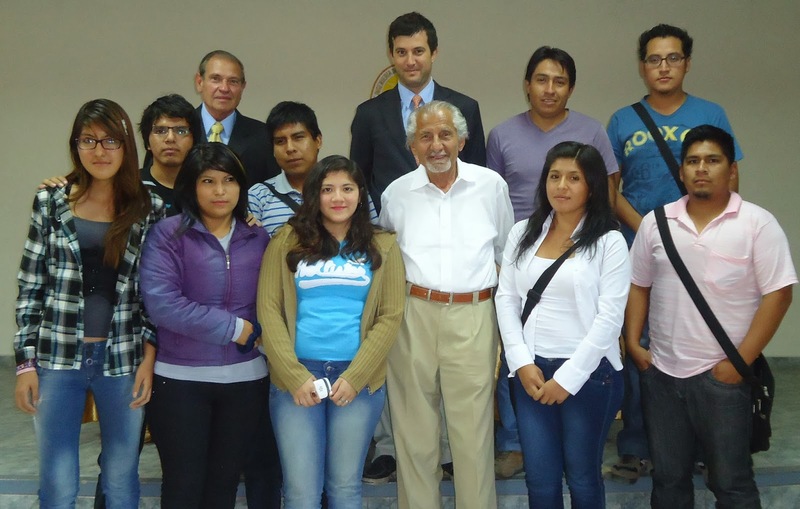 In May he was in Ica, Peru, where he gave a short course on the extractive metallurgy of gold. He will be in Peru again in November to give a short course on pressure hydrometallurgy in Lima, and then in December he will be discussing the heap leaching of phosphate rock with nitric acid at Agadir in Morocco. Even for a youngster such as me his schedule would be exhausting, so raise your glasses to him today. Fathi you are an inspiration! This morning Dr Simony Dominy from Snowden welcomed around 200 delegates to the 2nd AusIMM GeoMet conference which is held here in the Hilton Hotel, in Brisbane Australia. I have great expectations about the quality of this conference, which follows on from the highly successful inaugural GeoMet conference, also held in Brisbane in 2011. The conference was formally opened by Alice Clark, the immediate past president of the AusIMM. Alice duly noted her thanks to all the sponsors: especially for the platinum sponsor FLSmidth (FLSmidth are also sponsoring the MEI Process Mineralogy '14 conference next year). Following Alice Clark's official opening, Dr Simon Dominy did a brief survey of the mix of delegates attending the conference: a fairly equal mix of geologists and metallurgists with a few mining engineers. Somehow as a process mineralogist, I felt that my own career interests weren't captured since although I have degrees in both geology and engineering, I feel like I sit somewhere in between these two disciplines and don't have a real identity within either one of them. I'd be interested to hear from other process mineralogists what they feel. The first speaker of the conference was Professor Steve Begg who delivered the Pedro Carrasco lecture. Steve is the Professor of Petroleum engineering and Management at the Australian School of Petroleum at the University of Adelaide. His plenary Some reflections on uncertainty, decisions, models and people set the theme of the morning, focusing heavily on geostatistics. Steve noted a very real problem in industry in that the bigger and more important a project gets, the more likely it ends up in disaster. He talked through a variety of reasons as to why business outcomes are not living up to expectations: through gross under estimates and a naive understanding of NPV, as well as the fact that good decision making requires accurate estimates of uncertainty. He clearly clarified the differences between uncertainty and natural variation, in that uncertainty is a function of what we know. His underlying message to the audience was that the main role of the geoscientist / engineer is to support decision making and that technical work is aimed at uncertainty assessments to aid decision making. The theme of geostatistics continued through the morning and after lunch there was a change of pace focusing more on the topics of ore characterisation and texture analysis. Professor Dee Bradshaw from the JKMRC (a consultant for MEI's Flotation '13 conference in Cape Town next month), gave a review paper on The influence of textural variation and gangue mineralogy on recovery of copper by flotation from porphyry ore co-authored by Al Cropp and Will Goodall. Dee's paper set a theme for the conference in noting how important texture is in geometallurgy. She also talked through the first principles of the theoretical grade recovery curve, whereby the mineralogy ultimately dictates the overall grade and recovery emphasising the nature of the relationship between grade and recovery. The theoretical grade recovery curve is probably one of the most useful contributions that has developed out of the field of process mineralogy and I always ensure that I expose my undergraduate and postgraduate students to this concept. The afternoon continued through the theme of textures with some nice talks by Dr Julie Hunt from CODES at the University of Tasmania Estimating comminution indices through ore mineralogy, chemistry and drill core logging, as well as by Laura Perez-Baurneuvo on New perspectives on quantitative textural analysis. Laura is currently finishing up her PhD studies at the University of Madrid, Spain. I first met Laura at Process Mineralogy '12 in Cape Town at the end of last year where she gave one of the best presentations of the conference. Laura has developed some of her own textural indices that are centred on the use of linear intercepts and showcased using a case study from the Zambian copper belt. Day 2 of the conference started with a keynote from Prof Karin Olson Hoal from the Colorado School of Mines discussing the importance of mineralogical inputs into geometallurgical programs. She started fairly light-heartedly with a cartoon on the Pyrites of the Caribbean as an illustration of the role of mineralogy with the poor mineralogist trying to defend himself by pointing out that the gold is in the pyrite. Her key message was to emphasize that the mineralogy is the quantification of ore body variability and this needs to be incorporated into financial models for project variability. The second keynote was delivered by Steve Williams from GEOMET Tech in Canada: A historical perspective of the success of geometallurgical methodologies. Although somewhat controversial as to when the history of geometallurgy actually started, he did emphasize the need that people of multiple skills need to work together, and that often geomet just requires pure long term commitment from those involved in building and refining a geometallurgical model and believing it will provide long term value, even in cases where the model indicates that the deposit will not be economic. Once again, the theme of ore variability came through in that "there is no such thing as an average ore body". The rest of the day provided an interesting mix of case studies on gold, PGMs, uranium, iron ore, and copper; as well as the development of various methodologies as indicators of geometallurgical performance be they from actual physical tests (BWI, flotation indicator, leach performance) or from actual mineralogical and chemical data (e.g. the mineralogical approach of Prof Pertti Lamberg from Lulea University of Technology in Sweden). Caroline Johnson from CSIRO in Australia delivered a very articulate and interesting presentation on the microscale characterisation of pristine and processed calcrete hosted uranium ore that showed the need for a thorough understanding of ore forming processes when interpreting hydrometallurgical extraction. The conference dinner was held on Tuesday evening, and provided a good break from the formalities of the conference and a chance to catch up with old and new acquaintances to the backdrop of some light hearted live jazz. The third day of the conference continued on the theme of ore variability with a keynote delivered by Prof Malcolm Powell of the JKMRC, University of Queensland. Malcolm spoke on how the value of geometallurgy is not in the measurements and the data, but rather on how you use it and illustrated this by his vision of future mining where ore processing circuits leverage ore variability to maximise resource efficiency. This of course requires the ability to be able to model equipment and circuit performance with efficiency, which is the aim of his Research Chair in Sustainable Comminution. Malcolm's talk was followed by Dean David of AMEC Australia who spoke of how the Joint Ore Reserves Committee (JORC, managed through the AusIMM) now requires the reporting of geometallurgical information in mineral resources and reserve estimation. This is clearly an indication that geomet is here to stay and that geometallurgy is now becoming part of global best practise. My favourite talk of the conference was delivered by Michelle Sciortino from Royal Nickel Company who gave the best example of geometallurgy in practise in her talk on the geomet modelling of the Dumont nickel deposit in Canada. Michelle clearly showed the integration of mineralogical and metallurgical information in the geometallurgical model, and how it has been continually refined to account for the mineralogical complexities of the Dumont deposit. Last but not least, the conference concluded with some talks on the need for incorporating acid rock drainage (ARD) indicators into the geometallugical model. As we continue to process more mineralogically complex ores, so we need to be thinking about ARD upfront when designing the operation. Ultimately, we should be thinking about ways of removing ARD upfront rather than late stage treatment with lime addition. 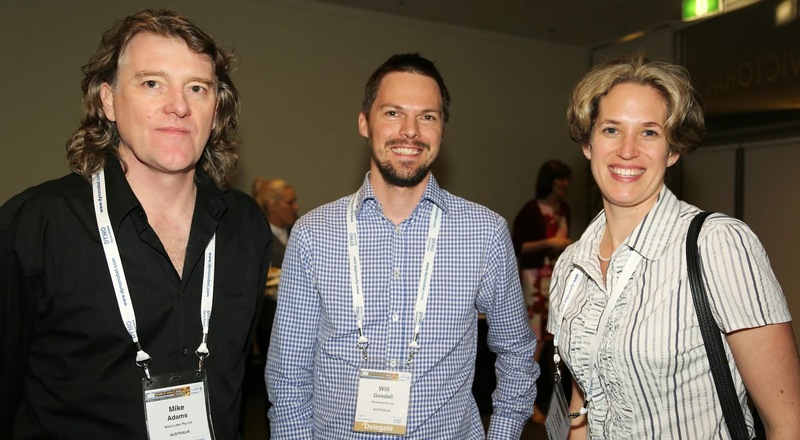 After the awards of the best young presenter prizes to Caroline Johnson from the CSIRO (best local presentation) and Michelle Sciortino from the Royal Nickel Company (best international presentation), Dr Simon Dominy gave his closing conference remarks. Simon spoke of how the challenges for geomet in the future will be to ensure that the geomet approach gets embedded in practise, ensuring correct sampling and testing methodologies especially on small scale samples, reducing mineralogical uncertainty and designing plants for ore variability. The 3rd GeoMet conference is planned for early 2016. 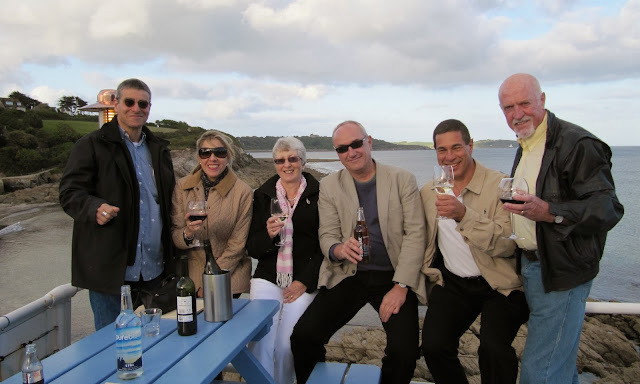 It is exactly 50 years ago this week since I started my undergraduate course in metallurgy at Leeds University and over the weekend we had very special visitors to Falmouth. 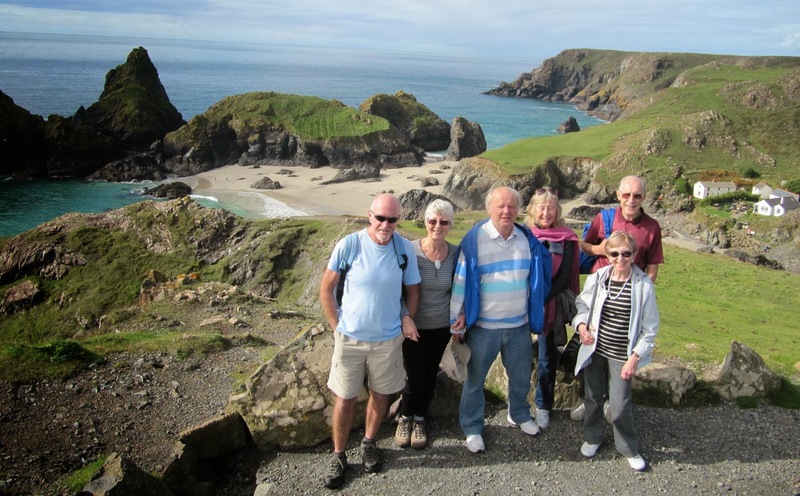 Bob Schofield and his wife Jean, and Graham and Sheila Neate were friends throughout our undergraduate days, and Bob and Jean we only made contact with again earlier this year. 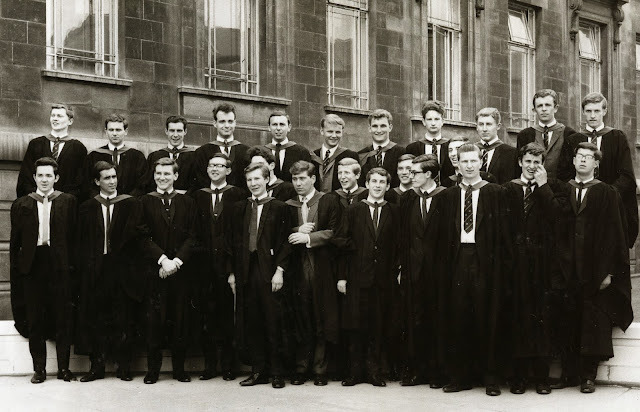 We naturally reminisced over many things, and had a laugh at a few of the old photos, including our 1966 graduation photo below. What is really noticeable now is the fact that all the graduates were male, and in all our 6 years, as under- and then post-graduates, we never saw a female student in the Houldsworth Faculty of Technology. And the lecturers were without exception male. They were also, with a few exceptions, not particularly inspiring. It was fairly obvious that to be a good, inspirational lecturer required a combination of enthusiasm, confidence and deep knowledge of the subject. Pat Kelly had these qualities in abundance. He taught crystallography, a subject which could have been made very tedious, but he brought his subject to life, as did the very eminent head of department, Prof. Jack Nutting, later my PhD supervisor, who impressed me by lecturing without notes, often wandering off on tangents but all the time communing with the class. Other lecturers occupied the other end of the spectrum. Apart from the specialist lectures in metallurgy, we also had lectures on the basics- physics, chemistry and maths. Unfortunately not just we metallurgists, but engineers, fuel technologists, ceramicists etc (all male!) and classes were held en masse in a huge tiered lecture theatre. I don't know how it was decided who would get the short-straw in terms of teaching these subjects, but it was a very short straw indeed. Chemistry 2T was taken by a ruddy Scot who quite obviously wished that he were somewhere else, anywhere else. As his lecture commenced, paper aeroplanes would begin to glide towards the blackboard, and the decibels would start to rise as the students discussed their weekend affairs and future plans. All the time his ruddy face would become ruddier until eventually, when the noise had reached cacophony levels he would suddenly stop and below at the top of his voice "FOR GOD'S SAKE, SHUT UP". There would then be a brief respite before the slow build up of noise levels again. This, however, did in no way compare with Maths 2T. A multitude of aeroplanes filled the air, some drifting lazily, others spiraling wildly towards their target, a hapless, young be-gowned lecturer, whose working life must have been a nightmare. Whenever he turned to write an equation on the blackboard, the aerial assault would be supplemented by an artillery bombardment of rolled up paper and even coins. While all this was happening, a register was being passed around the lecture theatre. We were required to show our presence by writing our names on the sheet, but of course if a friend was absent someone would sign in for him. It was also evident when the sheet arrived that there were a considerable number of people signed in who were patently not part of the course, Emma Royds, R. Sole etc. Surely he did not go away after the lecture and log all of these names in some kind of meaningless ledger? I found all this hard to believe. My working class background had taught me to respect my elders and betters, and school had imposed discipline by the cane, the slipper and the Bunsen burner hose. These people were University Lecturers for goodness sake, second only to High Court judges and Conservative MPs in commanding respect! I have to wonder why I was so enthusiastic about becoming a lecturer, when I joined Camborne School of Mines in 1973!! The students at CSM were also all male, and the first female graduated in 1984, 96 years after the School's foundation. When I left CSM in 1996 there had never been a female lecturer, now the Director is a woman and female graduates in mining and minerals engineering are commonplace around the world. How things have progressed and improved over the past few decades. 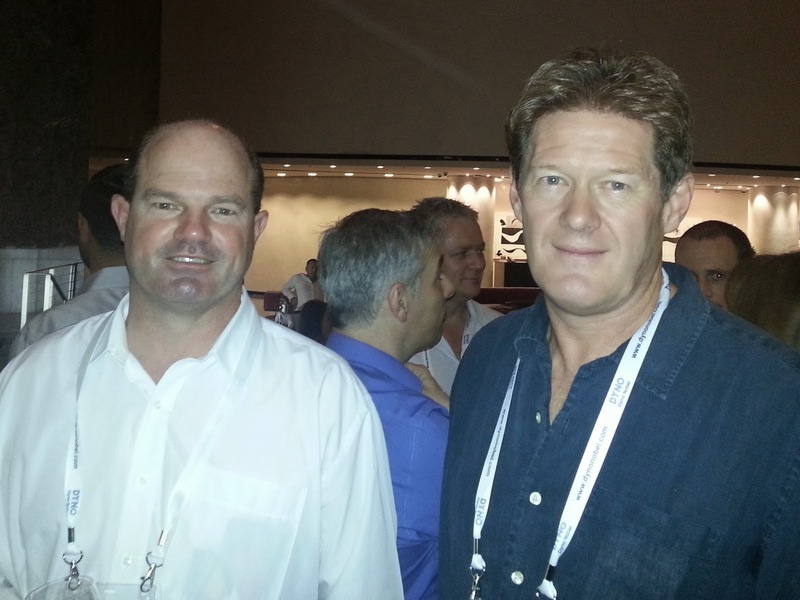 It was good to catch up with my old friend Ian Townsend, of Outotec, at the recent Base Metals '13 conference in South Africa. 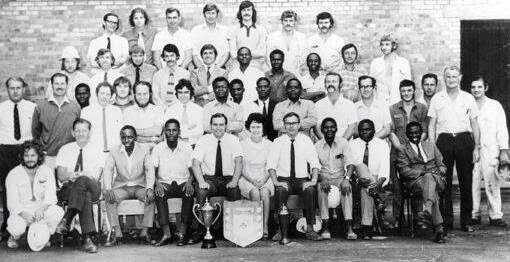 We were reminiscing about our time on the Zambian Copperbelt in the early 1970s. I was at Chingola, Ian at Mufulira. "I am top row, second from the left, in the days when I had hair and was 30kg lighter. On the far left is Martin Wright, next to me, now living in Cape Town. Plant Superintendent centre bottom row was John Aird, with whom I have recently re-established contact. He was heavily involved with initial development of the Chambishi Cobalt plant and was later involved with Kasese cobalt in Uganda. We had half-shares in a 505 racing dinghy and spent a lot of time swimming! Two places to the right on the other side of the lady is John Archer, who I still see occasionally and who is doing some consultancy from his home in Rutland (I think). There are others with whom I am still in contact such as John Newcombe and Andy Webster (2nd and 3rd from left on row below me). A couple of the Zambians were still working at Mufulira until very recently and we had good reunions on my return visits." If anyone can fill in the missing gaps, we would very much like to hear from you. Ian will be in Africa again in November, attending Flotation '13 in Cape Town. MEI was a media sponsor for World Gold '13, which was held in Brisbane, Australia from September 26-29, and organised by The AusIMM. 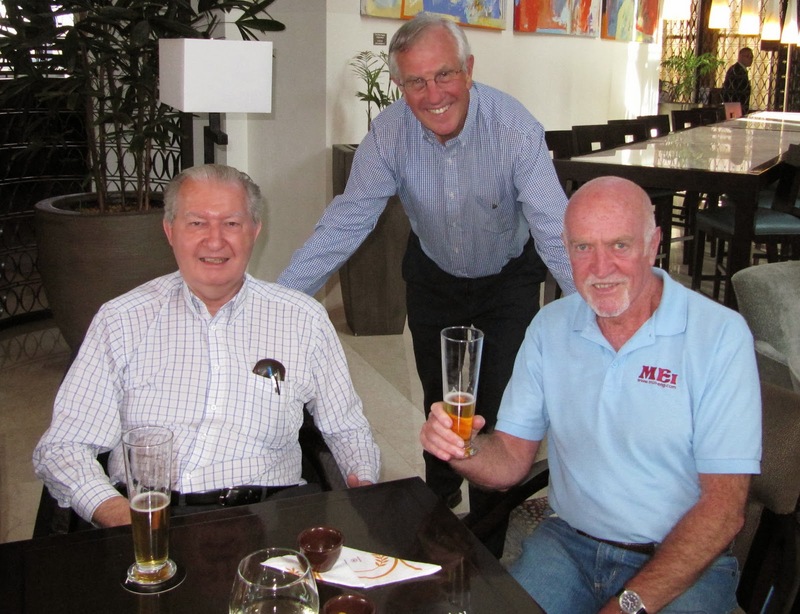 Dr. Mike Adams, MEI's Precious Metals '15 consultant, of Mutis Liber, Australia, represented us at the conference, and has kindly supplied this report on the event. 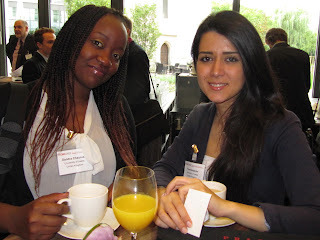 The World Gold series of conferences is held about every two years, the previous one being held in Montreal (see posting of 7th October 2011), which the author also attended. Last week’s event was staged over two days with some parallel sessions covering various aspects of gold including exploration, geology, mining, processing, finance and environmental. The conference was surprisingly well attended given the margin squeeze due to lower gold price and increasing costs, and attracted almost 300 delegates from many countries. On the other hand, this fact may itself be an indication that companies may be looking for new paradigms towards profitability in a difficult market, a mood that was revealed in presentations and informal discussions alike. To this end, the conference did not disappoint. The excellent plenary speakers on Day 1 commenced a guided tour by Eduard Eshuys (Drummond Gold) of major Australian gold discoveries. 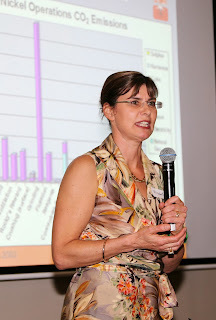 A more controversial topic was covered by Professor Jannie van Deventer (University of Melbourne), in “Is there gold that we do not recognise”, which elicited food for thought as well as several questions, some tongue-in-cheek. The three Day 2 plenary speakers (curiously whose names were all Mark) received an enthusiastic response. These speakers robustly (and indeed almost brutally) exposed the paradigm shift that is required for a successful gold producer in the current market condition. Mark Clark (Regis Resources) asked “How did the gold mining industry squander the golden decade?” and convincingly concluded that the industry should go back to basic principles in cost reduction and operational excellence. Mark Morcombe (AngloGold Ashanti Obuasi) exposed various factors both internal and external that impinged on the profitability of a gold operation. The third Mark, Mark Bristow (Randgold Resources) described the logic behind the great success in the company “Building a successful African gold mining business”, again highlighting simple back-to-basics business principles as being the key that may have been partly forgotten by some operators in the heady boom years. The 60 technical papers that were accepted were trimmed from about 120 submissions and were generally well presented and with sound content, with only a few general review papers and one or two that elicited probing questions. Best presentation to a young researcher aptly went to Dr Megan Becker (University of Cape Town and an MEI consultant), who made a lucid and professional presentation covering an important topic covering the use of mineralogy to interpret acid rock drainage. Several papers covered processing of refractory gold ores, suggesting that despite the current issues that many of these operations have been experiencing, these ore types remain prominent on the radar of explorers and developers. Interestingly, roasting was addressed in several papers, suggesting that for specific ores such as double refractory ones, it remains a potentially viable process route provided the off gases are adequately handled. On the other hand, the interesting paper covering Barrick’s Goldstrike thiosulphate leaching process represents a new technology that expands capacity rather than replacing the roaster plant. Other papers that stood out included two covering the 6.4 Moz resource 5.8 Mtpa Tropicana gold operation in Western Australia (first gold pour occurred two days after the conference). Both gravity and flotation methods of concentration were covered in very interesting sessions, demonstrating various innovations. 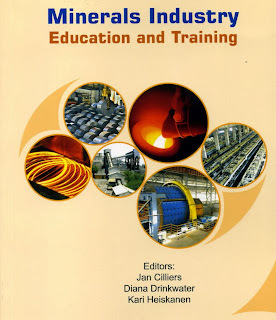 The environmental and water aspects of gold ore processing elicited interest, and the author was fortunate to be able to present a paper demonstrating how to obtain cyanide code compliance without installing a detox plant, on the basis of using hypersaline process water. There were several pre- and post-conference workshops, including one on “Cyanide Management in the Gold Industry: Showcasing leading Practice”, which elicited robust discussion amongst the ~25 delegates and speakers. For the more intrepid delegates, particularly those attending the back-to-back Geomet conference the following week, there were also workshops in the intervening weekend. 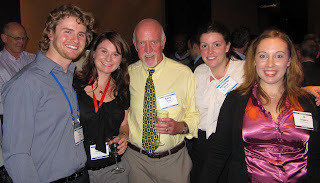 In addition, other events were held around the conference, such as the Delprat lecture (Professor Graham Jameson) and the CEEC (Coalition for Eco-Efficient Comminution) reception, which was held simultaneously with the official networking reception, so again decisions had to be made as to which to attend. 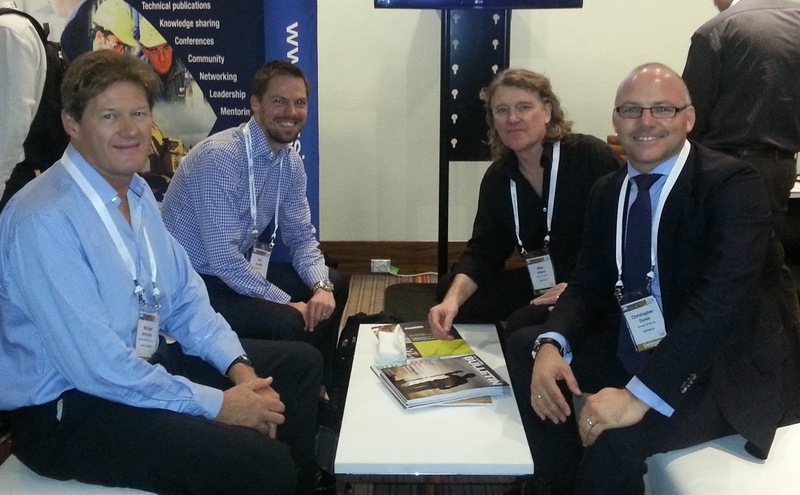 As usual, the “gathering of the clans” with a mutual interest in gold proved to be useful networking and catching up with old colleagues and friends, some of whom were present at the MEI Precious Metals ’12 conference in Cape Town (the next Precious Metals ’15 conference is to be held in Falmouth, UK over May 11-12, 2015 and is expected to again present discussions from cutting edge minds).